The fourth ODI between India A and the England Lions was disrupted by an unusual bee attack for a period of about 15 minutes. Although none of the players, officials or support staff, thankfully, sustained any injury, a group of five spectators were rushed to the hospital following the incident. The second best ODI teams of England and India are battling it out in a five-match series in the sub-continent. The Indians have clinched an unassailable 4-0 lead in the series, winning the latest one-dayer by 6 wickets. Rishabh Pant starred with the bat as he struck an unbeaten 73. The unfortunate occurrence took place in the 28th over of the Lions innings at about 11:05 AM. A few spectators at the top tier of the Sports Hub at Thiruvananthapuram would probably have disturbed a beehive, which consequentially led to an attack that offered little time to the victims to protect themselves. While coach Rahul Dravid, who was walking around the sidelines, had to scamper back to the dugout, the players did not leave the pitch. Instead, they bent downwards and gathered around the pitch and waited for the swarm to clear out. Apparently, the beehive was constructed by the insects under one of the seats at the west end. The five injured spectators were taken to Ananthapuri hospital nearby in order to receive medication, while all other cricket fans in the West stand were forced to rush to the East stand. After 15 long minutes, the play resumed, before the visitors were bowled out for a paltry 221. 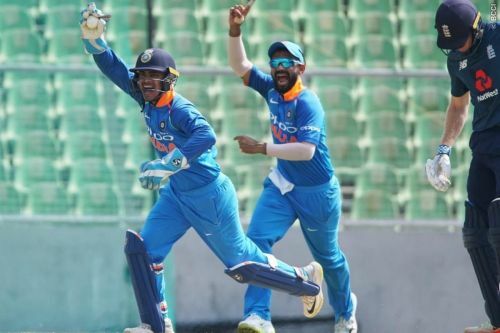 The dead rubber 5th ODI between India A and England Lions is scheduled to commence on January 31, at the Greenfield International Stadium, Thiruvananthapuram.